In a recent post called Pegged renminbi will be hard to internationalize, we discussed the issue China faces as it tries to maintain it's export based economy. It does so by holding the currency artificially low to make their product look cheaper to the world. To accomplish this, they must continuously purchase dollars, while selling renminbi. But where do they get the renminbi to sell? Well in what's called an "unsterilized" FX transaction, China simply "prints" the new renminbi to sell (as opposed to a "sterilized" transaction where the central bank sells currency spot but agrees to buy it forward, thus not impacting the money supply.) The newly "minted" renminbi sold by the central bank for dollars simply gets deposited in it's banking system, increasing the money supply. This is how they keep the currency from shooting up 30%. It's a dangerous game, because all that new renminbi deposited in Chana's banks has to go somewhere. 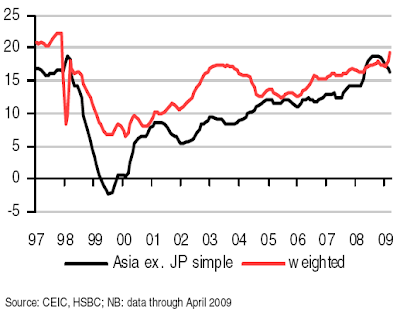 With the money supply growing rapidly, China could raise interest rates to control inflation. But if they do so while the USD rates are nearly zero, it will put even more upward pressure on their currency. If you have an asset at par with the dollar that pays higher rates and can only go up in value, you'd be buying as much as you can. 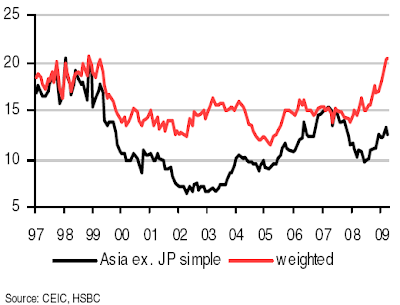 So as long as Western rates remain low, China has to keep their interest rates relatively low. 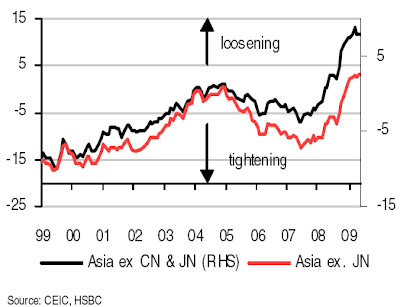 Banks in China are lending and will continue to lend at least some of those excess deposits. Thus unlike in the US, where banks are in the process of repairing their balance sheets, China has what's called a multiplier effect going. If people fear that all the stimulus in the US will create inflation, think about countries with a real multiplier effect. Given that the US, and Europe will keep their rates low for a while, by the time the stimulus in Asia is taken away, the bubble momentum will be unstoppable. The remarkable thing about such liquidity-driven asset bubbles is their long-cycles, underlining the eventual potency of loose monetary policy. Also, successive monetary tightening over the course of the bubble has apparently little impact: once the financial accelerator goes into full throttle, it takes aggressive tightening to pop the bubble – and, more often than not, policy-makers are reluctant to step up for fear of bringing down the house. 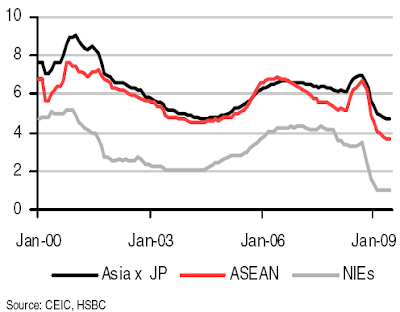 Credit continues to grow in Asia with no major slowdown due to the crisis. At the same time deposit rates are growing as well, driven in part by the "unsterelized" currency interventions that force dollar sellers to deposit the currency proceeds in that country's banks. Deposit growth and credit expansion accelerate the monetary base growth. 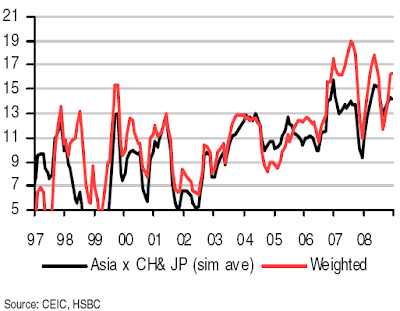 Expect corporate leverage, property, and equity price levels to balloon to dangerous levels as liquidity continues to grow unabated throughout Asia. This is the next big bubble.